Its construction began in November 2013, and work in the dry dock began in March 2015. The carrier was launched — moved into water — in April 2017. By now its outfitting — during which engineers installed and fine-tuned all interior equipment and weapons — has been completed. He said the vessel will be better than China's other aircraft carrier, the CNS Liao­ning, when it comes to deploying and supporting fighter jets in combat thanks to designs by Chinese engineers. Cui Yiliang, editor-in-chief of Modern Ships magazine, said the new carrier's sea trials will be like those of the Liao­ning, and the total time needed for the trials may be slightly shorter than the Liao­ning's because Navy personnel have had experience obtained through the Liao­ning's operations. The new carrier has a conventional propulsion system. Like the Liao­ning, it will use a ramp to launch J-15 fighter jets, the spearhead of China's carrier battle group. The ship also will carry several types of helicopters. According to sources from the Navy, several aspects on the new carrier are different from those on the Liaoning — the new ship's island (the towering section of the ship) is shorter than that of the Liaoning; it has three aircraft arresting wires (brakes) instead of four on the Liaoning; and the landing section is longer than the Liaoning's, among other differences. Besides China, seven countries — the United States, Russia, Britain, France, Italy, Thailand and India — operate a total of 18 aircraft carriers. The US is the largest operator, with 11 nuclear-powered carriers, each having a full-load displacement of about 100,000 tons. On Sunday, China's first domestically designed aircraft carrier set sail on its maiden sea trial. The new aircraft carrier is expected to be commissioned to the People's Liberation Army Navy. Two experts shared their views with China Daily's Zhang Zhouxiang. Compared with the Liaoning, China's first aircraft carrier, the new aircraft carrier has improved quite a number of aspects. For example, its hull is not only totally designed by domestic engineers and designers, but also follows the latest design, which has made huge progress compared with that of the Liaoning, designed decades ago. Besides, the hangar, the ship island as well as the ammunition lift of the new aircraft carrier have all been improved, and different sections of the ship, such as the radar system and the electronic system, merge better with each other. Thus it is not excessive to say the new aircraft carrier marks a giant step forward compared with the Liaoning. However, that does not offer any support to claims of certain Western media outlets, who guess that an arms race is underway between China, Russia and the US with China owning its second aircraft carrier. There is only one reason for China to strengthen its naval power and that is self-defense — defense of its maritime boundaries as well as its overseas interests. Besides, from the Opium War in 1840 to the founding of the People's Republic of China in 1949, China had suffered over 470 times from sea invasions by Western powers. For generations, a lesson has been carved in our hearts that China needs a strong navy to prevent such invasions. 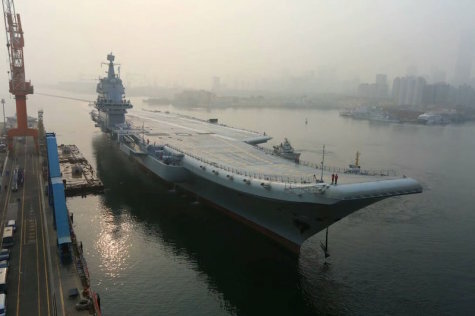 China's second aircraft carrier will promote the fighting capability of the PLA Navy further than the Liaoning, because the Liaoning is more for scientific research purposes than for combat and training purposes. Besides, the fact that China can independently design, manufacture and arm an aircraft carrier shows huge progress in the domestic military industrial capacity. Therefore, it is fair to call the new aircraft carrier a new starting point for China's development of its naval power. With ripe technologies in building an aircraft carrier independently, China will hopefully sharpen its technology in the future. Some Western media outlets take China's second aircraft carrier as an opportunity to hype up the "China threat theory". China does not need two aircraft carriers, they claim. Actually, when the Liaoning started its first voyage, they said China did not need any aircraft carriers. Their purpose is to weaken the PLA Navy. Their statement is ridiculous for anyone with the basic sense to believe. Just look at how many sea-based interests China has: defense of the maritime boundaries, peace and stability in the countries and regions involved in the Belt and Road Initiative, as well as keeping its maritime transportation lines open. One aircraft carrier fleet is obviously not enough for these. Of course, China won't build a navy that exceeds its needs, either. China does not seek hegemony or control over the ocean. Therefore, it won't build such a huge navy like the US. All these break the lies behind "China threat theory".